IEN# 117830 - Flotation Cells Manufactured by Outokumpu, Model OK-8. There are two (2) machines comprised of a bank of (3) cells and (5) cells. Each machine has a working capacity of 297 cubic feet. Includes motors. IEN# 117827 - Clarifier, Model Lamella 1500/55, Manufactured by Parkson. This clarifier is an Inclined plate type. It has a fiberglass plate pack and stainless steel Weir. Its operating capacity is 450 – 650 gpm. IEN# 117829 - Clarifier, Model Lamella 360/55 LGST, Manufactured by Parkson. 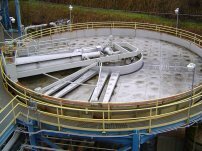 This clarifier has a capacity of 360 Sqft. Includes a sludge tank and rake, in addition to a flocculation tank.